Early Saturday morning during Tennis On Campus Section Championships, Davis Flanagan sat at the round table inside Lehigh University’s tennis center and flipped through the pages of a 6-inch-thick textbook. Focused on the pages in front of him, he quickly scribbled notes that – to most – appeared to be written in hieroglyphics. Ten minutes later, Flanagan’s twin sister, Bailey, and their teammate, Ryan Locke, joined him at the table with books in hand. Both dropped their tennis bags at their feet and began a 30-minute study session. 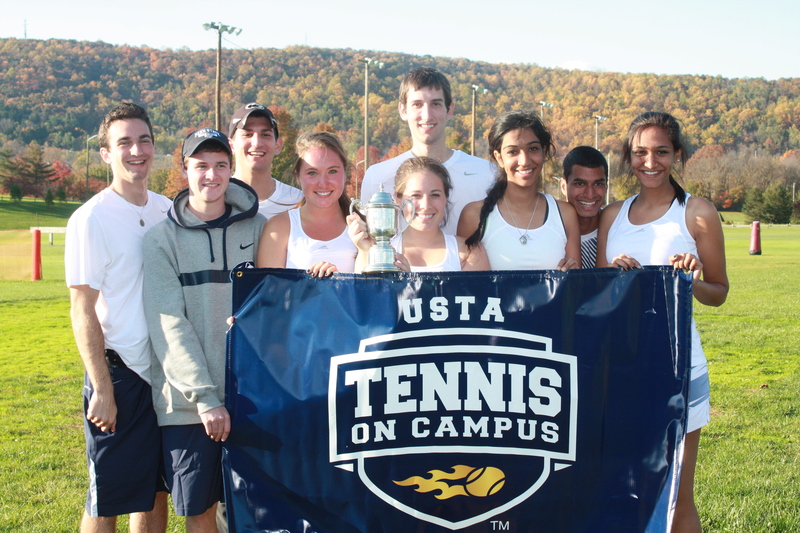 As they waited for their team to be called to the courts, the group displayed just what makes Tennis On Campus such a unique competition: Often times, the players are just as talented and competitive off the court as they are on it. As busy as the school work might get, players who compete in Tennis On Campus generally subscribe to the same way of thinking. Sure, it may be draining to practice four times per week, play matches on the weekends and still make their grades and maintain a social life. But to most, that small amount of extra stress is well worth it. Kim Nguyen, who serves as the team President for St. Joseph’s, is a perfect example. Nguyen is in her second-to-last semester as a biology major, and is now waiting to hear back from medical schools for next year. While academics have always been the most important aspect of college for Nguyen, she said tennis allowed her to be a part of a team and still take part in the sport she’s loved for years. The team aspect of Tennis On Campus always kept her coming back. For the majority of those involved with this past weekend’s championships, the competition on the court far outweighed the stress. The 21-team bracket eventually came down to a Penn State-Penn final for the second year in a row, with Penn State pulling out the win. With Penn holding the second-place spot, Drexel finished in third place and Delaware took fourth. All four teams will represent Middle States at Tennis On Campus National Championships April 11-13 in Surprise, Ariz.
Visit the Middle States Facebook page for photos.